A huge drop in the numbers of first year applicants has made the Dickinson School of Law rethink their dual-campus strategy at Penn State and Carlisle and according to the Dean, in order to make the Carlisle campus stronger, first year classes there need to be stopped. While nationally, law school applications have dropped by about 20% for this fall’s freshman class against the numbers in 2010, at Dickinson the drop has been more than 35%, dropping from 5,326 in 2010 to 3,458 this year. According to dean McConnaughay, the best strategy is to shrink first-year classes at Penn State from the original target of 250 to about 150 and shift the first year classes entirely to Penn State. Currently there are only 162 first-years with 107 in State College and 55 in Carlisle. Since the 2nd and 3rd year courses can be even taken by distance education, “But first-year instruction is delivered completely in person,” the dean rationalizes that consolidating the first-year classes in State College would save money. It would also free up space in Carlisle for various growth-oriented activities including an one-year course for foreign lawyers that’d let them sit for New York Bar exams. 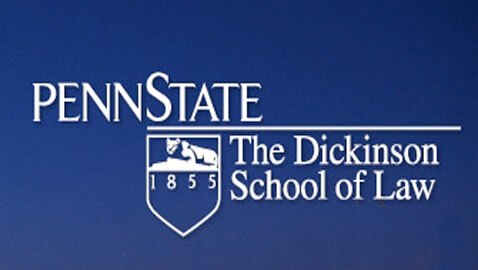 However, critics are pointing out that when Dickinson School of Law had merged with Penn State in 1997, Penn State had given assurances that the Dickinson School of Law would remain in Carlisle “in perpetuity.” And the critics are pointing to Penn State’s track record of breaking trust. Getting rid of Dickinson School of Law’s original Carlisle campus seems to have been on the agenda of dean McConnaughay for quite some time. Even in 2003, long back before the present economic recession or any glut in the job market for lawyers, he had written a memo proposing a relocation of Dickinson from Carlisle to State College. The battle that rose out of his proposal ended in a 2005 settlement consolidating the current dual campus approach, major renovations at Carlisle, and a requirement that Penn State keep a full three-year law program at Carlisle through 2025. But the dean is back again now with new strategy and new reasons. Chipping away at the base, and hijacking first-year classes would be a start to what he wanted in 2003. According to McConnaughay, the proposed chances are required to keep Dickinson School of Law on track as one of the best law schools in the nation.